In the heat of summer, smoothie is calling out for its cool and refreshing characters. It’s fun to play around with all sort of fresh fruits, vegetable, nuts… all kinds of things to add to your smoothies. This time, let’s try something new that work wonder on your breast (^.^), skin, weight loss and whole body system. 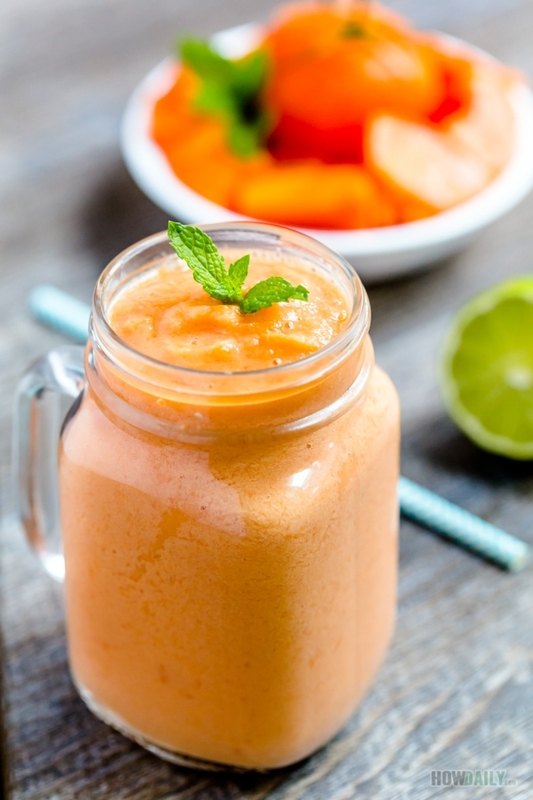 Introducing the powerful papaya tomato smoothie. You may have not know this, but papaya has so many benefits on your body, so that consuming a few periodically do wonder for your body in achieving that perfect shape. If you’re not blessed with one or if they’re sagging and losing their firmness after birth, breastfeeding, etc…papaya is a natural consideration. Did you know that most, if not all of breast enhancers, either topical cream, pill, etc. are using papaya as theirs main ingredient. Papaya, especially the raw green ones, contain phyto-estrogen similar to the female’s estrogen necessarily for breast enlargement. Couple up with daily breast massaging and regular breast/chest exercise routines, yours should be improved visibly within a month or two. Papaya has high content of water and is full of fiber. Consuming papaya anytime of the days would help speed up your weight loss progress tremendously. In the East tradition, we would stew raw/green papaya with a protein right before and after birth. This is an effort for an easier contraction during delivery and increase in mother breasts milk production. It work perfectly with papaya salad, smoothies, and juice too. Papaya both green and ripe, contains vitamin A, C, E and other nutrients to help with your immunization system while supplying anti-oxidant of cholesterol to prevent heart disease and cancers. Folid acid within papaya help with conversion of homocysteine to avoid damaging blood vessel walls and reduce the risks of stroke or heart attack. Papaya contains load of papain and other proteolytic enzymes that work wonder on your digestive system. Papain breaks down meat and other protein effectively, so much that it’s often used in commercial meat tenderizer. Consuming papaya after meal, especially the green to medium green-ripe one tends to help speed up protein digestion from meats, gluten, casein, etc. Now if your digesting problem is large and need stronger doses, try the papaya seeds in small quantities. They taste like pepper or wasabi but contains a lot more than the raw fruit itself. If you need milder treatment, ripen papaya, even without all the enzymes sap, still contains load of fiber, neta-carotene, vitamin C, folate acid… to help with digestion and cancer prevention. Papain in green papaya and (a lot more in) papaya seeds suppresses progesterone in women and reduce fertility in men. Many Asia countries’ men & women use a teaspoon of papaya seeds a day (or 1/2 tsp for seed powder) continuously for a prolonged period (3 months and after that) to work as pregnancy prevention. Daily The effect would last 6 months after stop taking. Ripe papaya doesn’t contains as much enzyme for this to work. Thus, no papaya during pregnancy or if you’re waiting for one. Another affect of papain in green papaya and papaya seeds is to get rid of parasites and infection within your body. Similar to its ability to speed up protein digestion, papain breaks down intestinal worms, parasites and their eggs. It also normalize your intestinal tract to prevent future worm and parasites’ hosted. Carpaine found in papaya seed when consuming in small quantity is super effective on killing parasites, amoebas and other viral infection. Papaya – green, ripe and seeds has many other benefits such ad support immune system, prevent certain infections and recurrent illnesses. It’s also protect against macular degeneration and improve eyes sight. Its enzymes help with treating allergies, trauma and producing anti-inflammatory effects. Direct application to health sports injuries as well. Skin damaging and anti-aging are also other benefits. So you know that papaya is good, perfect in some cases to treat health problems. But as with any fruit, over consuming is not encouraging as you might overwork your gastrointestinal system by too much laxation. Also, if you are pregnant, expecting or waiting for one then try to avoid papaya overall. 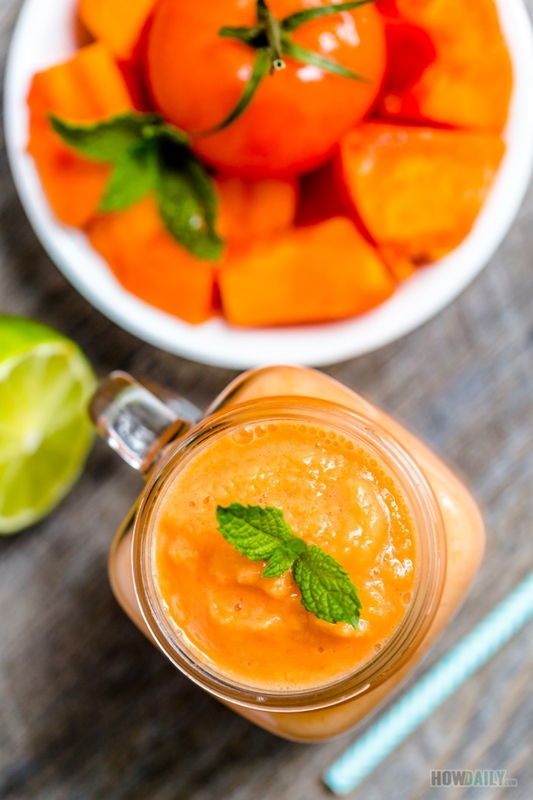 Enhancing the look and feel of your breast, skin and body weight loss with this papaya tomato smoothies. Power it up with some papaya seeds to prevent health issues and treats your problems too. Peel off the skin of papaya, cut into halves to scoop out seeds (and save it). Cut papaya into strips and then cubes. Add about 2 cups worth of cube into blender. (optional) Add 1 tsp of papaya seeds into blender as well. Parboil, peel and remove seeds from tomato (if using large one). Cut the flesh and throw into blender. Pulse and blend until fully mixed and thick. (optional) You could cook papaya mixture before hand for ease on the stomach. Just pour the puree papaya into a small sauce pan and bring to boil then simmer for 10 minutes, add more milk if need. Let it cool to room temperature before adding back into blender. Juice 1 tbsp lime, spoon in honey and top with crushed ice.